Like all decades, there were positive aspects to the music of the 1980s and there were negatives. 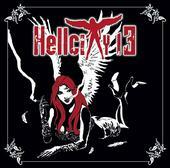 Hellcity 13 are primarily a pop band with assorted hard rock undertones sprinkled throughout their album. They obviously loved music from the 80s because they seem to aspire to sound like they were from that time and it is just more than being influenced by the music. They sound quite a bit like something you might hear on the radio between say 1986 and 1989. It’s all here, the big vocals, ultra smooth production, grating keyboards and an overall syrupy feel. Okay, it's not all bad yet this band hits upon a lot of the features that I disliked about this style of music when I first heard it twenty-odd years ago. Some of the vocals are decent enough and at times they even sound like they were patterned after Billy Idol or Michael Monroe. Occasionally there are a few fleeting guitar parts that show some flair. Still those parts are few and far between plus they seem to have gotten swept away rather quickly by the overall ham-handed approach with which this band tackles their songs. There are parts here and there that work and I certainly believe they like the style in which they have chosen to play and that’s great. Yet they are not smooth enough writers to really pull this off and they need to be. I think even fans of this style would easily pick up on the fact that the band struggles to carry solid melodies that could really help this style. There are moments when a song may begin okay, but then the band seems like they don’t quite have a good handle on the pace and the song quickly slips into being a pale copy of the style they so badly yearn to emulate. "Hellcity 13" is not without some moments, but overall this band really needs to spend some more time figuring out their direction. For more information, check out http://www.hellcity13.com.